Hello! Guten tag! Ni hao! Welcome to a fresh edition of Global Chatter from the team at Comtec Translations. As experienced translators with a passion for language, we love words from all over the world, especially in the form of inspiring literature. To celebrate translation and literature from the world’s diverse cultures, we’re making this edition of our monthly round up all about international, translated literature. To celebrate global literature in translation, we’ve scoured the web for some of our favourite recent blogs, posts and reviews all about international literature. From Culture Whisper’s favourite books translated into English, to the 100 greatest Nigerian novels. Looking for some inspiration to get yourself stuck into some international whisper? As English-speakers we rarely read outside of our mother tongue and, in the vast majority of cases, we rarely read translated authors. Because English is so widely spoken (and written) the sheer glut of native texts all too often precludes us from reading more international literature. This bumper list of must-read international, translated texts from the fantastic Culture Whisper blog is the perfect antidote to that. Fire up your Kindle (or your Amazon account) and dig into one of Culture Whisper‘s seven recommended reads, from heart-warming Italian post-war historical fiction, to post-modern Swiss murder mysteries. 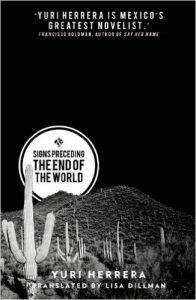 In May 2016, Yuri Herrera’s Signs Preceding the End of the World, translated from Spanish by Lisa Dillman, won the 9th annual Best Translated Book Award. If this fabulous review from Rebecca Hanssens-Reed on the must-visit Asymptote blog (the premier site for world literature) is anything to go by, the win was well-deserved. Following the fate of Makina as she searches for her brother across the US-Mexico border, the setting of the novel is familiar, yet its treatment, Hanssens-Reed claims is anything but, and is all the more spectacular for it. Well worth checking out! Read the full review on Asymptote. With an estimated 1500-2000 individual languages, Africa is a continent rich in tongues, experiences and stories. With a strong literary tradition which is inseparable from its rich oral storytelling tradition, Nigeria alone is recorded to have had 521 languages spoken within its borders, though at least nine of these are now extinct. While some Nigerian authors choose to write in English, others weave their words in Hausa, Igbo, Yoruba and Fulfulde. This fantastic, expertly curated list published on the (equally fantastic, expertly curated) Africa Writes website celebrates this diversity with a slideshow of 100 of the greatest Nigerian novels. Time to dive in! Do you have a favourite Nigerian novel? What about your favourite novel in translation? Have your say below.